Serie EN | TROX Malaysia Sdn Bhd. The volume flow controller is a mechanical self-powered unit and works without external power supply. A damper blade with low-friction bearings is adjusted by aerodynamic forces such that the set volume flow rate is maintained within the differential pressure range. The aerodynamic forces of the airflow create a closing torque on the damper blade. The bellows expand and increase this force while at the same time acting as an oscillation damper. The closing force is countered by a leaf spring that unrolls over a cam plate. The shape of the cam plate is such that a change in the differential pressure leads to an adjustment of the damper blade in a way that the volume flow rate is maintained almost exactly. As a result, the volume flow rate remains constant withinnarrow tolerances. 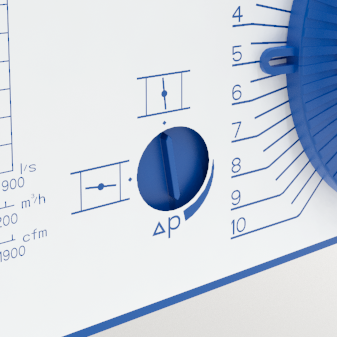 The volume flow rate setpoint value can be set quickly and easily using the rotary knob on the external scale; no measurements are required. The advantage over flow adjustment dampers is that there is no need for repeat measurements or adjustments during commissioning. If the system pressure changes, e.g. by opening or closing a string when using flow adjustment dampers, the volume flow rates in the entire system changes. This is not the case with the use of mechanically independent volumetric flow controllers. A mechanical self-powered controller reacts immediately and adjusts the damper blade such that the set constant volume flow rate is maintained. Quick sizing tables provide a good overview of the room sound pressure levels that can be expected. The first selection criteria for the nominal size are the actual volume flow rates qᵥmin and qᵥmax. Intermediate values can be interpolated. Precise results and spectral data can be calculated with our Easy Product Finder design programme. The quick sizing tables are based on generally accepted attenuation levels. 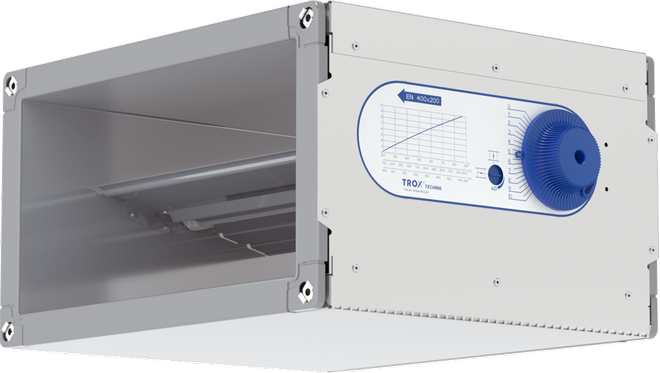 If the sound pressure level exceeds the required level, a larger air terminal unit and/or a silencer or acoustic cladding are required. The sound power levels for calculating the sound pressure levels were measured in the TROX laboratory according to DIN EN ISO 5135 – see "Basic information and nomenclature". 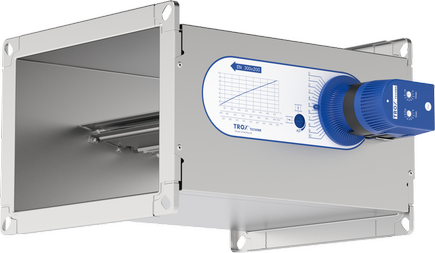 Rectangular volume flow controllers for constant air volume systems, mechanical self-powered, without external power supply, suitable for supply or extract air, available in 19 nominal sizes. Ready-to-commission unit consists of the casing containing a damper blade with low-friction bearings, bellows, external cam plate and leaf spring. 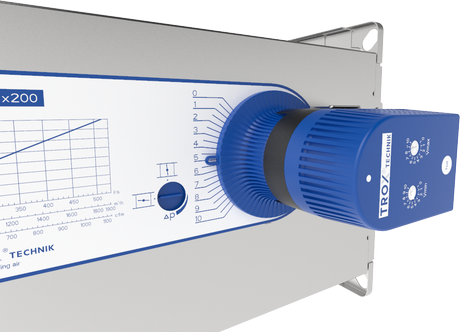 The volume flow controllers are factory-adjusted and preset to reference volume flow rate. Sound power level measured according to DIN EN ISO 5135. Meets the hygiene requirements according to VDI 6022. 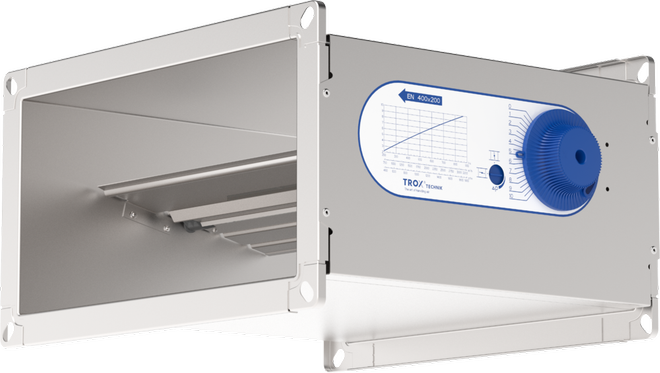 The volume flow rate accuracy Δqv applies to a straight upstream section of the duct. Bends, junctions or a narrowing or widening of the duct cause turbulence that may affect measurement. Duct connections, e.g. branches off the main duct, must comply with EN 1505. Free air intake only with a straight duct section of 1.5B or 1,5H upstream.